Home » Cameras and Lenses » Telephotos: The Ideal Landscape Photography Lenses? It’s no secret that landscape photographers love ultra-wides. If your lens isn’t equivalent to at least 16mm, you just aren’t part of the club. And if you really want to prove your worth, you’re definitely using a 14mm lens, or a 12mm, or, for the truly dedicated, a fisheye. (You can always de-fish it in Photoshop, after all.) But what if landscape photography has another side to it – a side that can be just as good? In fact, that just so happens to be the case. For many pictures, the best landscape photography lenses aren’t wide-angles at all. They’re telephotos. I’ll start this article by saying that everyone is different, and that’s especially true when you’re talking about personal preferences like camera equipment. I like telephotos; you may not. Perhaps you shoot everything with a fisheye lens, or a tilt-shift lens, or an 800mm supertelephoto. I don’t write this article to change what you do, but instead to provide some reasons why one popular recommendation – that wider lenses are best for landscapes – isn’t always true. One main reason is scale. Wide angle lenses don’t do a good job of showing the massive size of distant elements in a landscape. If you’re standing at the base of a mountain, an ultra-wide can make it look like a bump on the horizon. An example? A few years ago, I visited Colorado for the first time to meet some of the Photography Life team. I had just bought my first truly wide angle lens – a 20mm. That’s far from extreme, but it was the widest I had ever used before. 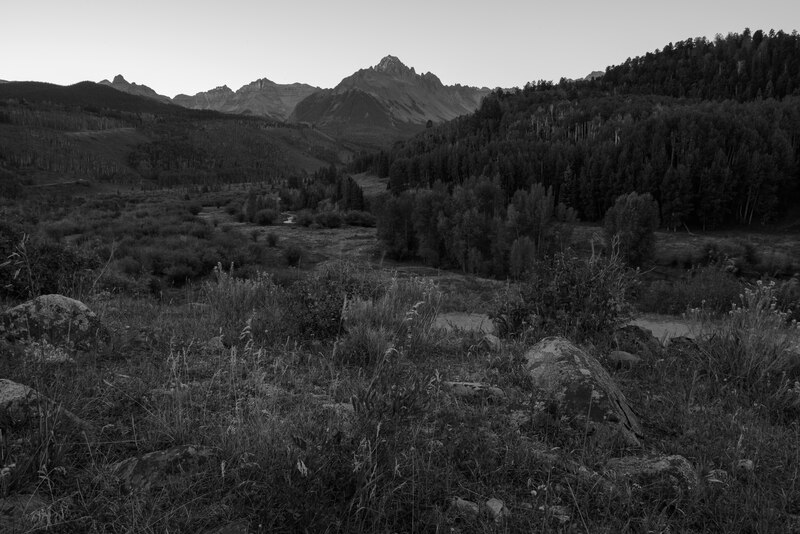 The first thing I did upon arriving at an overlook of Mount Sneffels was to slap the new lens on my camera. I might not have been all the way at 12mm or 14mm, but I felt pretty great about my setup. So, why does the photo above look so bad? I’m at a beautiful scene on a nice morning. There aren’t any clouds, but I still should have been able to capture a decent photo. Instead, when I used the 20mm, I practically erased the mountain from existence, and I filled the frame with useless details instead. That’s a clear difference. Sure, the light is better, but the biggest improvement in the second photo has to do with composition – the overall scale of Mount Sneffels. By using a telephoto lens, you don’t have to be practically on the mountain you’re photographing in order for it to be the right size in an image. Scale isn’t the only benefit of a telephoto, either. Long lenses also work well because they give you much more control over the elements that appear in your photo. With a wide-angle lens, so much of the scene in front of you will inevitably end up in your image – a patch of grass, a lopsided cloud, a jumble of tree branches, and so on. Whether or not it adds to your message, you might just have to live with it. You can try moving around and adjusting your composition, but it’s not always possible to fix the problem completely. Telephotos are different. They cover such a narrow field of view that you have more control over what you include and don’t include in a picture. With a telephoto, you can simplify your composition significantly. This makes it easier to unify your message, as well as take certain types of photos like abstracts that may be tricky with a wide angle. That’s not to say images from a telephoto are always simple, or that wide-angle shots are always complex. Instead, it’s that zooming in makes it easier to exclude details you don’t want in your frame rather than capturing everything at once. For many landscapes, that’s a big deal. Then again, I’d never recommend that you only use a telephoto. Personally, I still shoot a huge number of my photos with a wide-angle lens for one reason or another. But there are plenty of times when telephotos are ideal – enough that I consider them essential for landscape photography. So, are telephotos the best landscape photography lenses, even more than wide-angles? There’s no a good answer to that question. Can anyone say whether something is “best” when two of them are equally important? I use wide angles and telephotos almost exactly 50/50. They’re both necessary. To some photographers, one may be more useful than the other, but that’s all down to your personal style. To top it off, the scene in front of you also makes a big difference. 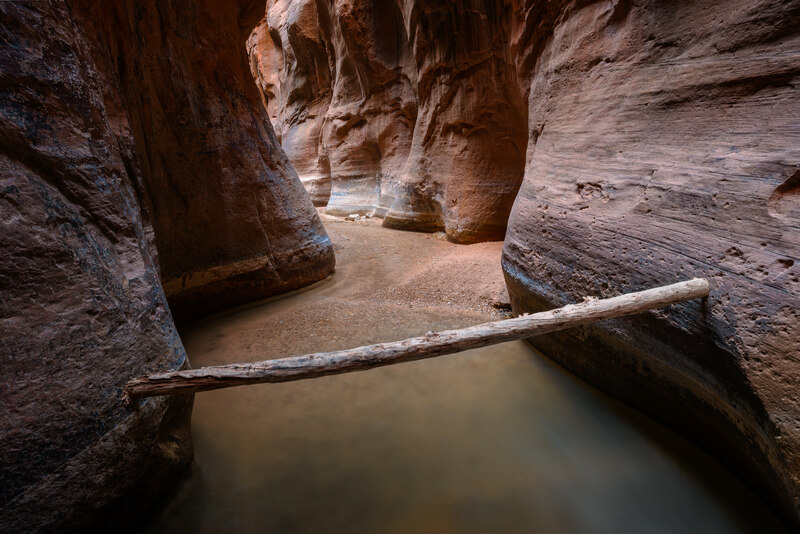 If you’re in the American Southwest, with slot canyons and crazy lines in the foreground, I’d generally recommend a wide angle. If you’re hiking in the Alps, and you’re trying to show the size of distant mountains, a telephoto can be a huge help. For nature photography as a whole, there’s a reason why both lenses have a place in my bag. Landscape photographers should be flexible. Having a mindset that wide angles are the end-all-be-all for landscape photography simply is not accurate. For many photographers, a telephoto is just as important, and, for some, it’s at the heart of their style. Either way, if you’ve never thought of telephotos as landscape photography lenses before, you owe it to yourself to try. Pair this with a framework to choose the best landscape photography lens. Then, explore some of Nikon’s best lenses for landscape photography and for taking Milky Way pictures. I do bristle, I’m afraid, when people obsess over one thing. Usually it’s the result of an attack of “opinion-itis”. How can ANYONE claim that one particular lens is “THE” lens for landscape (or any other purpose, for that matter? You are absolutely right, Spencer (as usual). We should all try different lenses – and different anything else, for that matter. I sometimes experiment with a zoom on a smaller cam, to test what I think is the “right” focal length – and then switch to my main cam, once I’ve worked out what focal length I want to use for the shot. Thank you, Pete! Good tip with regards to using a smaller camera ahead of time. Back when my only lenses were primes, I generally had a good sense of which focal lengths would look exactly right (and even used visual tricks like extending my arm to a certain distance and seeing the area covered by my hand to know exactly the field of view I would capture). That’s gone a bit out the window now that I mainly use zooms. As I myself take landscape pictures near the Alps more often than not (quite the coincidence with your example) while using an 18-105 kit lens I find myself almost never using it its widest. A few times I did wish I had a wider lens but I could still just do a vertical panorama which, while not as immediate as a single picture, is still plenty good. The photos I like the most though, have almost all come zoomed in at what would be telephoto territory for a full frame camera. This article and follow up replies are extremely relevant and very important to blokes like me who have not been taking photos for very long and are learning on a daily basis. I do mostly landscapes with a 28-70 Sony lens. Next week I’ll have a Sony 24-200 and I’ll still be taking landscapes and i’ll also have a go at long distance shots.. Thank you for your comments re. the landscape scenario, it helps me a lot, and you folk are 13 hours behind us.. You are actually standing on my head on the other side of the world.. As you probably can tell, I’m an Aussie.. Thank you.. Neville ….. Happy to hear it, Neville, and best of luck with your new kit! I think you’ll find the range beyond 70mm (as well as slightly wider than 28mm) will lead to a nice expansion of subjects to capture. Tomáš, excellent, this article would be quite relevant to you then! Mountains are simply excellent with a mid-range or telephoto lens, since it leads to such an impressive sense of scale and perspective. I’ve taken some wider shots of mountains that I like, but almost exclusively when I was on or very near the mountain. Very useful article. You are absolutely right. Composition in any photography and specially in landscape is critical. The best way, I think is to see work of renowned landscape photographers, go and try different compositions, show your work wherever possible to landscape photographers to understand the improvement required, go back to the same location and try again. I do not know if there is any short cut. But once again thank you for a very nice and short article on composition of landscape photography. Thank you, Aniruddha, glad you liked the article – and I think you’re spot on. There are few shortcuts to improving in photography. So much of it is down to deliberate practice. Spencer, thank you for writing this article! There is a knee jerk reaction when ever landscape photography is mentioned, “wide angle”. With the software available today a moderate telephoto,or even something like a 50mm with a full frame DSLR can produce outstanding wide images by stitching multiple images. An 85mm used for distance vistas will add a lot of detail that would be lost with a 14mm (for example). with about zero distortion. What kind of lens to use is really dependent on what the photographer wants to convey and how he wants to do it – landscape or anything else. Absolutely, the photographer’s goal and the scene itself are both major factors when choosing the ideal lens for a scene. Agree. Now im using a 300mm and 200mm for my landscape series with amazing results. I realy love the perspective compression and the isolation of parts of the view. I would like to show here some examples but the page doesnt let me. Happy to hear that you’ve found 200mm and beyond so useful for your work! I don’t have a 300mm+ lens at the moment, but have borrowed them from time to time, and the sense of scale and isolation you can capture in some scenes is quite impressive. I am interested in using my 70-200 for landscapes but combining several images in a panorama. This way you get the breadth of view and the benefits of compression. Any plans to write an article on that? Actually the compression often attributed to telephotos derives from standing further back when you’re using one. That means stitching multiple long lens photos together gives you exactly the same amount of compression as a shorter focal length would! Use the lens (and camera, and flash or no flash, and…) to take the picture YOU want to take. This also means taking enough photos to figure out what you like. And taking a variety. I still have occasions I think a tele will work great and it doesn’t or vice-versa. Experiment. Enjoy. Interesting to hear that you like the wider dunes photo more, but I can see why – it definitely has more context to it. Thanks for adding these thoughts! Love your treatment of Mt. Sneffels. We had a home in Ouray when the kids were still school age. 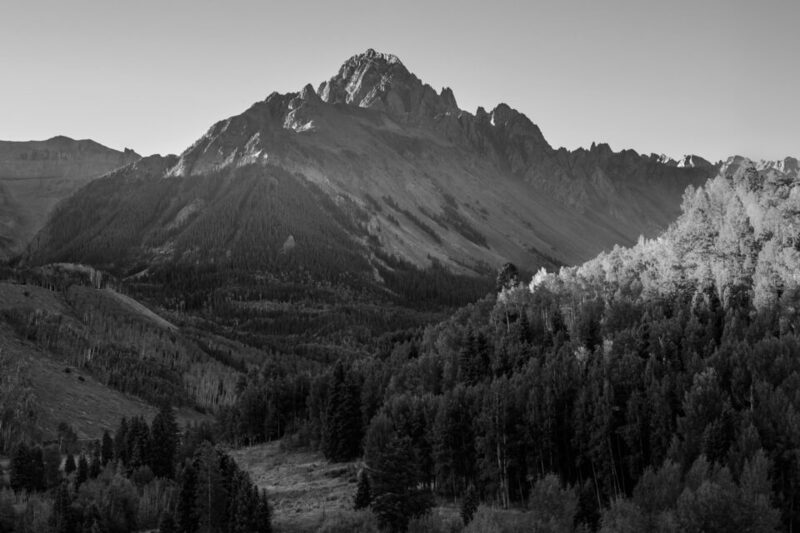 The drive over Dallas Divide toward Telluride always took out breath away at the Double RRL Ranch looking up to Sneffels. Good for the soul, and telephoto definitely called for, even looking back at it all these years after from Scottsdale AZ. Thanks, Doug! It’s a beautiful area. I’ve only been a couple of times, but I’m hoping to make it out there again in the near future! I use telephoto lenses much of the time shooting rural landscaped simply because you can’t get to where you might want to be mostly because you would have to walk on private property and shoot from private property. Or the scene is just generally too distant. Many times I would prefer to get closer but it is logistically not possible. The telephoto is not the ideal solution because DOF is just not as malleable as in a wide angle, but it does allow you to pick out a subject area which otherwise is impossible. Yes, the depth of field side of telephotos can be tricky, especially with a foreground. I end up shooting more images at f/11 and f/16 than I might like, but sometimes it’s the only way to capture the photo. Great article, showing the strengths and shortcomings of wide and Tele lens’s. I learned a lot, so thanks. Thanks, Barry, happy to hear it! Wonderful stuff as usual. I always look forward to your pieces. Once again here you are on to something. Longer lenses in landscape photography do allow for composition control especially with regard to abstraction. I also love the compressed field of view. Recently I have taken this attitude you have expressed of using telephotos with regard to landscapes, into the city. Why should street photography only be done with wide or normal lenses as is often suggested? I have even taken my 200-500mm downtown. Yes, some things are not going to be able to be fit into the scene, but the ability to shoot architecture from a lower angle gives a much less distorted view than close up and the massive compression allows for terrific cubist style scenes! I am in no way going to jettison my 16-35mm, but I am going to spend much more of my time focusing on the possibilities available by going long in landscape and otherwise. Thank you again for treating us all to your thinking. Thank you, Duffy! Very interesting, I’d imagine that telephoto street images are a great way to capture something more unusual and intriguing than with everything with at 50mm. It’s always good to shoot outside the range of “recommended” focal lengths just to experiment and see what happens. At least for landscapes (and it seems like for street, too), the results can be excellent. And, as important as personal preference may be, I would suggest the even more compelling question is *what story am I trying to tell? * At least for me, when I engage my brain and vision with this question, it helps me to choose the focal length that best serves that purpose. A strong image will stand out to most, so I would suggest it is not just a matter of taking a capture you are content with. A strong image will pull most into it, without explanation. It will invite them to want to see that place, or that critter, to have the experience your image reflects. What focal length you choose doesn’t inspire me – what you do with what you choose may. Yes, photography really is all about conveying your message and story. If a telephoto makes that easier, use a telephoto – and if a wide, use a wide! The lens I use most of the time is the 24-70 f2.8. Most of my landscape capturing lies within this range. The lens on the second place is my 70-200 f4 (sometimes partnered with a TC1.4). In third place I have my 16-35 f4 lens. As you mentioned, wide angle lenses tend to exaggerate the foreground (creating tension) while squeezing the background. In some case that works very well but not always. That is probably the reason why I use the 24-70 lens the most. I guess there is a time and place for each lens. Definitely, the medium range also is not one you should forget! I like the range around 35mm or so for less exaggerated – though still wide – perspectives, when something like a 14-24mm lens is just too exaggerated. Thanks for adding this. Finally! I’ve been shooting landscapes, seascapes and cityscapes for over 40 years and the widest lens I’ve ever used was 20mm. These digital days the widest lens I have is 24mm but mostly I use my Nikon 70-200mm f/4, my 85mm f/1.8, or even my new Tamron 150-600mm. I’ve never been a fan of the super wide lenses and their field of view. occasionally I use my Nikon 24-70mm, but that’s about it. Very nice, and happy to hear that you like the telephoto range as well. For at least a year, my widest (and only) lens was a 105mm prime, and it wasn’t nearly as limiting as one would think. I just got a lot of practice knowing exactly what scenes worked well with it, and how to use it for the results I wanted. I’ve been a foto shooter at various levels for at least the past 50 years and still honing my skills with just as much eagerness as when I received my first camera at age 15, a Kodak brownie holiday made of bakalite! And I firmly believe that this short and most excellent article is a must read for any and all budding picture taker’s. I’m very happy to hear that, thank you, Zen! Great article, Spencer. As someone who never shoots wider that 18-20mm equivalent, I guess I’m not “part of the club”. I use these wide focal lengths mostly for the narrow streets of old cities. 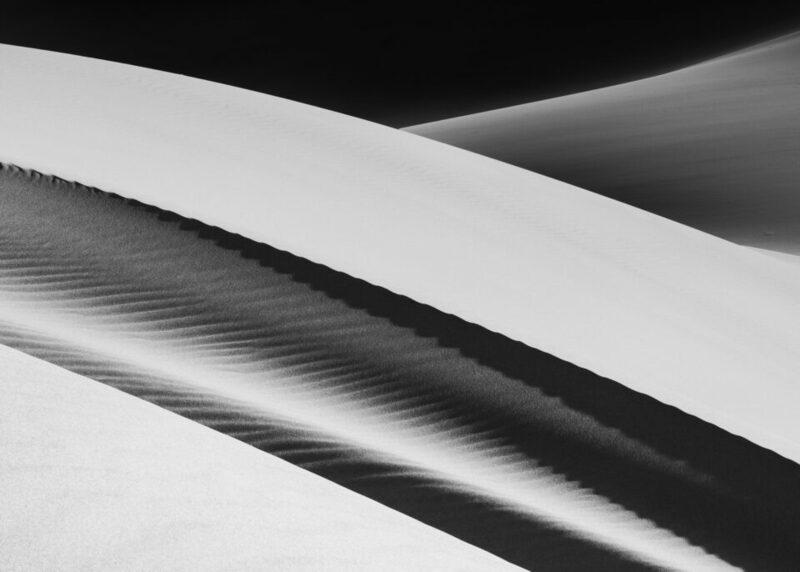 On a recent trip to Morocco, my best shots of the sand dunes were shot with my 70-300mmm , typically at 100-150mm equivalent. At the end of the day the “best” lens is the one that renders the photographer’s intent and vision. I’m happy to say that the Only <14mm Club isn’t one worth joining! Photography is all about making decisions - lens choice, camera settings, composition, etc. - that align with your emotional message and vision, as you say. I love sand dunes at the telephoto range, and it would be quite unfortunate if a photographer didn’t want to give telephotos a shot for landscapes. They’d miss out on a whole world of photos. I don’t if that’s provocation (a style that seems to be more and more in favor on this site, unfortunately —maybe a capillary contamination of the current presidential style?) or if you really think it, but using only wide-angle lenses to do landscapes is the unmistakable sign of a one-track mind, and I cannot believe that readers here are like that. The widest lens in my current kit is a 15mm (I don’t use the 14~24 anymore), and I don’t take it very often. I usually limit myself to a 19mm, so I’m probably not “dedicated” enough —although it IS tilt-shift, and therefore could be regarded as cheating— and the landscape lens I use the most is the 24mm. I am quite sure people know how to use long lenses in landscape photography, even though it all depends where you are, of course. A 135mm won’t be much use in Antelope Canyon, for instance. For ages, my widest lens was 24mm, and I think it was still fair to say I was a landscape photographer then just as much as now. Indeed, this whole article is about why the exaggerated views represented in those first sentences are false. You make a good point about not being provocative for the sake of itself. That’s becoming more and more common online, and isn’t something we want to fall into at Photography Life. I’ll keep it in mind going forward. Agreed! It is now unfortunately too rare to see sites where people are so civilized and helpful. I guess quality content attracts quality readers. There are some places out there where the only outcome of commenting on anything is a boatload of hateful replies. Hi Spencer, good to put out these opinions backed up with good examples, as you have here. You’ve said in the last part of the article that you take BOTH wide and telephoto lenses along with you, as I am sure most photographers would do also. There is no perfect lens, there is only the perfect lens for the scene in front of you at that moment. I would never go out with just my 14-24 Nikkor and risk happening upon a scene where a 100mm would be perfect, ruining my trip. I think sometimes we need to be reminded of basics, like going back to the days of Ansel Adams, and the ridiculous weight of his large format camera bodies, and lenses too, they were usually much heavier than the kind we have today, even our professional gold ring (or red ring) models! These days, if you don’t have room for two, or even three lenses in your kit, you need to rethink it. A golfer would not go off with one putter, one iron, one wood and one ball, after all. This is coming from someone who bought the nikkor 14-24mm fairly recently, so I hope it carries more gravitas when I say, for heavens sake take BOTH lenses to the party – They weigh a kilo, or just over two pounds – no excuse to leave it at home! Thanks again for your interesting views and articles. Agreed on all counts! The 14-24mm gets some negative press for its weight, but it really is amazing that we can capture such insanely wide photos at a wide aperture – especially for night landscapes – in a 2 lb/1 kilo package. I’ve been enjoying mine a lot, and only switch to my lighter 20mm f/1.8 when I’m on a long hike or need filters. Even then, I’m up in the air whether I’ll just go for the 14-24mm on an especially important long hike later this year (weeklong trek, but should be some incredible scenes). I’m leaning toward yes. These days, I wouldn’t go for a landscape shoot without at least one wide and one telephoto. If I’m working out of a car, I have two wide lenses, a normal lens, and a telephoto. It just opens up a world of possible subjects to have both rather than just one – though I do know a couple people who stick with one or two lenses/focal lengths exclusively, with great results. I always read with great interest and attention the excellent articles written by Mr. Cox. Indeed the wide angle lens has been labeled as the “landscape lens” for several generations. I began to see the difference in the 70’s when I was still using film. I noticed at the time that using a tele I could compress and isolate pat of the landscape making the resulting image more interesting. Ever since a tele is my companion when I photograph sceneries. The same happened to me with street photography, a 50 or a 35mm lens and coming close to the subject was what street photographers of the past did but when I began to use my tele with street photography I began to enjoy what I was doing and everything changed for me. Teles, do not leave home without one. Thank you, William! Above, Duffy was commenting about using a telephoto for street work as well, and I think you both are onto something. It’s common wisdom to use a 35mm or 50mm, sure, but that’s mainly because it worked so well for some famous photographers in the past (and one in particular, Henri Cartier-Bresson). It’s not that these are bad lenses for street work – not at all – but that it pays to keep an open mind to other possibilities! Great comment. Have often wondered why the isolating effect of telephoto is not advocated for street photography. Not sure if this is helpful, but I’ll put it out there. If you have the time to pause, then pause and take notice of your surroundings and contemplate how this 3D world will look on a 2D print/screen. As mentioned, use whatever glass you have in your bag to get the results you “think” you want. Then if time permitting, try another lens. During post-processing, you may be surprised by the alternatives you captured. Now the tech part. Wide-angle to telephoto, not only crops what you capture but changes the perspective of the elements. With a wide-angle, the distance between elements will be greater, whereas with the telephoto the distance will be compressed. That is with a wide angle lens, the gap between something in the foreground and the background may seem miles apart. With the telephoto, the distance may seem like a short hike. I struggled with wide-angle lenses for a long time, mainly because I couldn’t capture what I was seeing in my mind. It wasn’t until I used ultra-wide angle lenses did that change. It is also more than that, with these lenses you have to get up close and personal with your foreground subject. Sorry, but 24mm doesn’t fall into this category. For full frame, I’m talking 14mm-16mm lens. Angled slightly down or more from the horizon and you’ll have a dramatic effect. Again, not to duplicate what has been said, but there is no wrong lens. Depending on the subject and the light, one lens will probably get closer to your vision than another – at that moment. Clifford, I think this is quite useful – thanks for adding it. In terms of translating the 3D world into a successful 2D snippet, that is indeed one of the greatest challenges of photography! Some people will try to close one eye to envision the scene with fewer depth cues. I tend just to look at the LCD (or viewfinder) for the same purpose – not a creative solution at all, but a valuable tool to have regardless. In the area I live, I have little use for anything below 24mm — there are no vast spaces of desert, mountains or ocean beaches. Even in a place like Olympic National Park, I only sometimes wished for something below 24mm. On the other hand, I have used telephotos up to 400mm for landscapes, including sunsets. (1) You have to be very careful about your eyes with sunsets taken with long telephotos. You might want to compose and focus with a strong ND filter, compose before the sun drops into the scene in the viewfinder, or use a mirrorless camera. The second option is my preference. (2) Distant scenes taken over certain kinds of terrain with a long telephoto in mid-day sun can be plagued with mild “heat wave” subtle enough not to be noticed by your eye in the viewfinder, but strong enough to render a noticeable smear at pixel level. Another informative article, thanks again – your first example nailed my attempts at using a 28mm for landscape photos so now I am looking forward to experimenting with my new 105mm. Thanks for the article and the photographs which illustrate your points – often photos are louder than words. I often see wide angle landscapes with blank meaningless space in the foreground. Yes the impression of space is established but the images lack drama and are boring. Wide angle landscapes do work, but the challenge of good composition, especially foreground interest, is immense. You have provided us with the challenge to think telephoto as a regular alternative to the politically correct wide angle. One nice feature of some telephotos is very low vignetting. This is useful for stitching together a very large panorama with minimal banding. 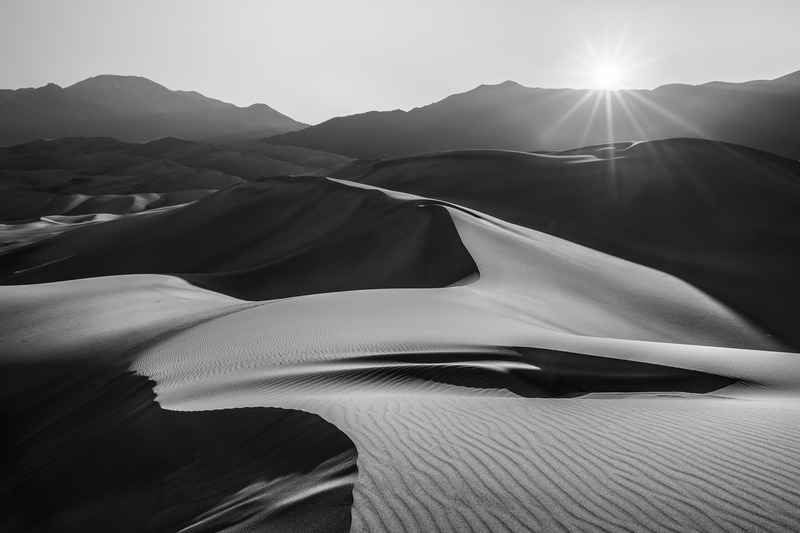 On my last trip to Death Valley, I used a 200mm AI-S at optimum aperture to make very large panos. The detail is superb, and allows any desired cropping without loss of image quality. My normal pano lens is a Micro Nikkor 55mm f/2.8 AI-S stopped down to f/11 for the most uniform sharpness and the center and extreme corners. The Sigma 135mm ART appears to have extremely little vignetting at its optimum aperture. I really like seeing those articles that challenge ideas that are readily accepted by many as “the rule”. Sometimes the conclusion will be that the original idea really is the right one, but even then, I think it is a worthwhile discussion. Technical and artistic considerations will be explored, and whatever comes out of it will usually apply to more styles of photography than what was initially being discussed. Hope I’m making sense here. The shoot is scheduled for September. I’m thinking I should just take a speedlight, trigger and a small diffuser?? Thinking…before sunrise. What do you guys think? Spencer Cox? Happy to help! You definitely don’t need an ND filter or a tripod to do a post-graduation shoot. Taking test shots definitely is a good idea. If you are planning to bring a speedlight and trigger, is someone else going to be with you who can hold the flash off-camera? Or, are you planning to bring a light stand? If you’re trying to go lightweight, I would stick with just the D3400 and 18-55mm lens. Zoom into 55mm if you need more of a telephoto perspective. One last thing – if you want to use flash, it can be helpful for the flash color matches the sunlight’s color. If this is at sunrise, you may want to use a flash gel to color the light properly. This is something you will definitely want to test ahead of time in similar lighting conditions to get a result that looks natural.